This primer is very much is a BEGINNERS guide to a very specific bit of systems science that is of interest in many domains of engineering design, particularly those involving complicated subsystems (think oil and gas process plants, aircraft, space stations, military technologies, nuclear power plants and their control systems...). The primary focus of the book is on ways of 'categorising FIXED system structures across the dimension of modularity vs complexity'. This is of use in choosing such structures for different engineering design purposes. 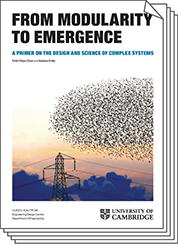 For researchers in the realm of engineering systems design, it complements and adds to the reasoning found in e.g. the literature on Morphological Analysis of Zwicky, function/structure/attribute mapping, Suh's Axiomatic Design theories, and in DfX literature relating to manufacturing for reliability. The pdf of From Modularity to Complexity can be downloaded here.